Maurice Lacroix watches have been manufactured in Saignelegier, in the heart of the Swiss Jura mountains, for over forty years. Immaculate timepieces were created for several large brands by the Desco von Schulthess Company, which held private label signatures on cse, dial, and movement. In 1975, Desco von Schulthess launched its own first watch models under the name Maurice Lacroix. Since, Desco von Schulthess has won a multitude of major awards for their watches. The company constantly hones their craft to deliver a new paradigm on time to create masterpieces for the consumers in their never-ending search for success. 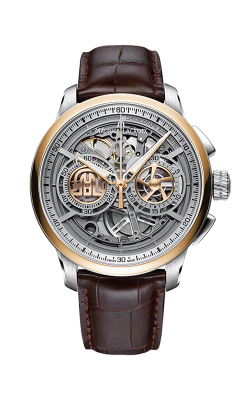 Their motto â€œSuccess is journey, not a destinationâ€ is the center initiative of the Maurice Lacroix watchmaking culture. Popular Maurice Lacroix watches for men include the Masterpiece, Pontos, Les Classiques, Miros Chronographe, Eliros, and Aikon collections. The timepieces in the Masterpiece Collection are the perfect balance of Maurice Lacroix expertise in a contemporary and elegant 21st century. The Pontos collection brilliantly entwines Swiss watchmaking traditional practices with modern design. The timepieces in the Les Classiques collection are a result of the elegance of traditional watchmaking. 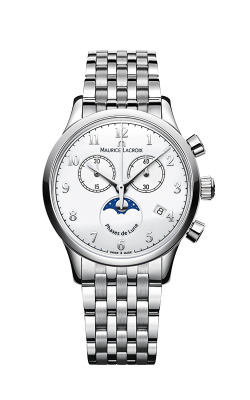 The Maurice Lacroix watches in the Eliros collection unveil a modern, practiced aesthetic. In addition to the menâ€™s collections, Maurice Lacroix also creates many beautiful watches for their female fans, including the Les Classiques, Fiaba, Aikon, and Eliros collections. Divinely slim and made for women, the Fiaba name represents seductive femininity. Fiaba's Maurice Lacroix watches are available in three versions: black, silver-plated and mother-of-pearl. In 2016, Maurice Lacroix changed the branding of their iconic model, Calypso, to the intriguingly named AIKON: a timepiece with a contemporary design, honed to perfection. The AIKON exudes luxury with every piece, and will be sure to last. Why Shop for Maurice Lacroix Watches at Costello Jewelry Company? Costello Jewelry Company is located in Glen Ellyn and Naperville, Illinois, and serves the Chicago, Wheaton, Aurora, and Downers Grove areas. Founded in 1979, for almost four decades, Costello Jewelry Company have provided customers with a competitive selection of designer brand engagement rings, wedding bands, and timepieces. Costello Jewelry Company is proud to be an authorized retailer of top designers and a specialist in jewelry repair, timepiece repair, and custom jewelry design services. For more information on Maurice Lacroix watches, events, services, and other products available today at Costello Jewelry Company, please call (866)-790-3272, visit Costello.net, or stop by either of their Glen Ellyn or Naperville, Illinois, showrooms.